Kayaking is an awesome water sport. People of all ages loves to go on a kayaking tour. It’s a great way to enjoy the beauty of nature. So it’s a great matter to own a kayak. And if have owned a kayak then you have to think about its transportation. You need to carry it to the water and that is not that much easy as most of the kayaks are not that lightweight. If they are lightweight still it’s a pain to carry them every day. So you may keep your kayak in the store for day after day and let it mixing with dust. But that’s not a good work, Is it? So all you need to do is to purchase a perfect kayak cart that will make the transportation easy for you. A kayak cart is also called a kayak dolly. Kayak carts are made for carrying your kayak easily from one place to another. It carries the kayak’s weight of the kayak, so you don’t have to get the pressure on your back. So you are planning to buy a kayak cart then you have to do a lot of research on it as you will not want to invest your money in a useless product. But you may not have time to do that much research. Considering your problem I am here to provide you this article with all important information on choosing a perfect kayak cart. You will also get the best 5 kayak cart reviews in this article so you will be able to pick a kayak cart from there easily. And for that, you have to read the whole article carefully. I am sure you will find it very useful. Now let’s check our comparison chart. The Suspenz Smart Airless Cart is a very popular cart in the market. With the help of this kayak cart, you can transport your kayak easier than any other kayak cart. The cart is made of aluminum. The frame is made of aluminum with steel hardware. It can be folded into a small size so you can store it easily when you are not using it. The maximum weight capacity of the cart is 125 lbs. The wheels are 10 inches in width so it’s very strong and will never get flat. It has a strap to hold your kayak safely. It has rubber pads which protect your kayak of falling down. The cart comes with a mesh carrying bag. And it is only 10 pounds. So it's really easy to carry it. It is durable, long lasting and saltwater resistant. And it’s the best of my top 5 list. The Malone Clipper Deluxe Universal Kayak Cart is another popular cart. It can hold up to 200 pounds weight. It has oversized padding for protection. The 10” tires are very strong and will never be flat. It can help you to transport various types of kayaks. You can roll over any kind of path. The size of the cart is 29” x 14” x 7” and the weight is only 9.3 pounds so you can carry it easily. The removable tires help you to store it in a little space removing them. It has locking kickstand so you can be worry free when you are loading or unloading your kayak. Up to 200 pound loading capacity. 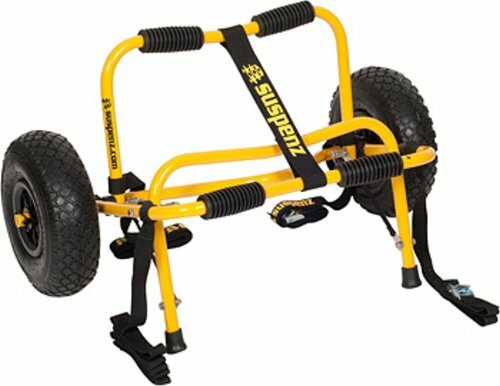 The TMS Kayak canoe Cart Wheel is very helpful for transporting your kayak. This cart is designed in “V” shape which helps to keep your kayak stable when you are transporting. The 13” nylon straps help to connect the cradle. It can hold up to 120 pounds. The cart can be folded that makes it easy to store it even in a little space. The foam bumper protects your kayak while trekking over different surfaces. It is only 9 pounds in weight. Easily transport a single kayak from the parking lot to lake. It is an amazing kayak cart from Settle sports. This is an adjustable cart suitable for almost all seat-on-kayak. It is made of anodized aluminum and stable enough to bear heavy weight. It can be dissembled and can be stored very easily in your car or kayak. The tires are airless so you don’t need to be worried about leaks. 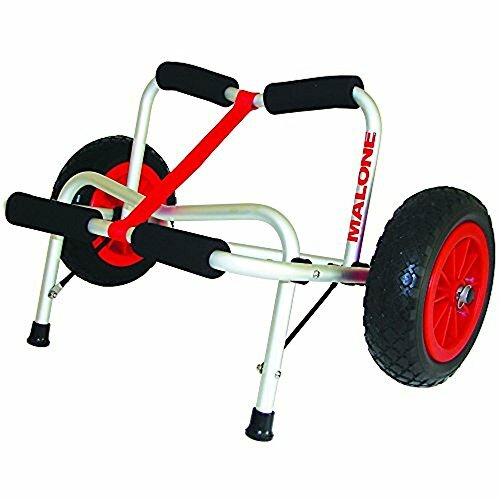 Malone Xpress Scupper-Style Kayak Cart is a cart that is designed for those kayaks which have scupper holes. It can be fitted with various width of kayak that means you can adjust the width. And the limit is 6.5” to 16.5”. It is made of corrosion resistant aluminum frame and stainless steel. The weight capacity is 200 lbs. It has foam pads that ensure that your kayak won't be damaged. 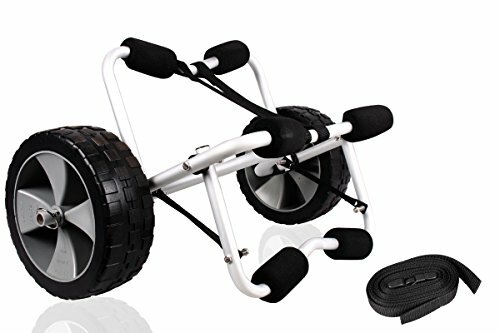 It comes with 10 inches “never go flat” wheels which can roll over any terrain. It will release your headache of carrying a heavy kayak yourself. This is the first thing you have to consider before you proceed to buy a kayak cart. There are three types of kayak cart available in the market. 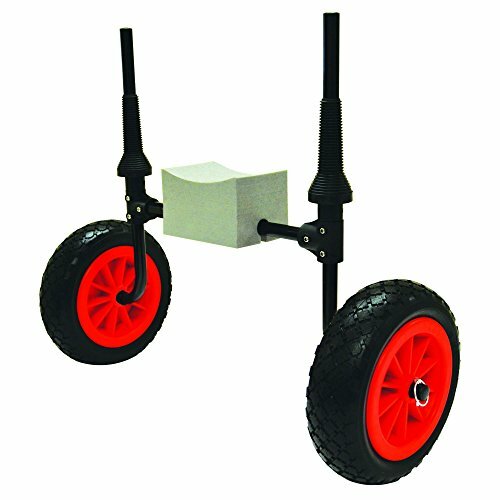 This types of kayak carts have fixed wheels and a fixed area to place your kayak. The frames of the cart make it too much stable. The size of the cart is also fixed so you have to consider if you have enough space in your car to place it. These types of kayak carts can be folded when not using it. So it’s easy to store it. They are also very lightweight. You need to carry your kayak you just need to unfold your cart and load your kayak on it. If you are planning to purchase this type of cart you have to keep one thing in mind that how heavy your kayak is. And if the cart will be able to bear the weight of your kayak. These types of carts have a strap for protecting vessels during the time of transporting your kayak from one place to another. For the best experience, you have to choose the best kayak trolley. But choosing the best one is not that much easy. It’s a really difficult task to find the best cart as there are millions of brands and models of kayak cart in the market. However, you can do it by considering some factors. Now I am going to discuss those factors elaborately. Let’s check them. The Wheel of a kyak cart is an important thing to consider. And I think it is the most important element. There are different types of the wheel of a kayak cart. Some are narrow while some wheels are wide. Narrow wheels are perfect for a smaller kayak and for the concrete road. Wider wheels are suitable for heavy kayaks and allow you to move through rocky terrains. There is also some cart with inflatable wheels. And they are suitable if you are moving your kayak over sandy areas. 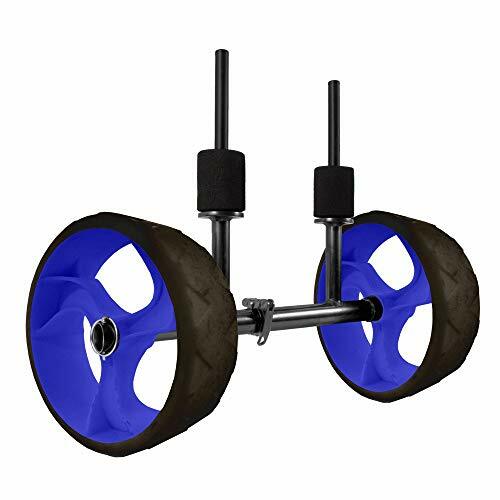 So you may now ask which wheel to get "The answer is, find those wheels which are best for your kayak and also consider through which paths you move your cart. This is another important factor that you have to keep in mind. Every kayak doesn't have the same width. So you should choose cart which has the ability to change its width limit. An adjustable width system is really important otherwise you will not be able to carry different kayaks. So don’t forget to check this feature before buying a kayak cart. Frames which are made of steel are cheap but very strong. They are a little bit heavy but they will provide you good service. The problem is they can be damaged by saltwater. If you are going to salt water then you should find a cart which is made of aluminum. And this cart is lightweight and the material is salt water resistant. Price is a thing that you can not but think about. There is a rule, the more money you spend the better product you will get. You will find a kayak cart in a very cheap price in various e-commerce site. But I will suggest you not to choose those cart for saving money. Choose a quality product even if you need to spend some extra money. However, You can find a perfect kayak cart at your budget even if it is too low. You have to do research for that. When you have your work done with the kayak dolly, you have to store the dolly. Now here you will want to have an easy string system. Some cart can be folded and some are disassemblable. So you should find a cart that is easy to store when you are not using it. Ease of travel is the main advantage of having a kayak cart as you can move your kayak or canoe to any place with it. Some kayaks are lightweight but most of them are heavy so you won't want to make pain at your back carrying them yourself. A kayak cart will protect you from having a back pain. You can go out for a kayaking experience anytime, anywhere as you have no tension of transport the kayak. I hope you have read the whole article carefully and enjoyed reading it. Now as you have already read you must have a clear idea. I think now it's not that much difficult for you to choose a perfect kayak cart at your budget. I will suggest you for “The Suspenz Smart Airless DLX Cart” As you read the review you already know that this kayak is the most popular. It’s stable, durable and long lasting. However, you are free to make your choice yourself. Just go ahead and pick the one which is perfect for you. Wish you all the best.